Cambridge has a close relationship with its ‘necklace’ villages. On the A10 south Harston, Foxton, Meldreth, Shepreth and the town of Royston not only have people traveling to Cambridge for work, shopping and leisure but there is considerable movement in the other direction to employers at Harston Mill and the technology and science parks in Melbourn as well as leisure destinations such as Shepreth Wildlife Park. 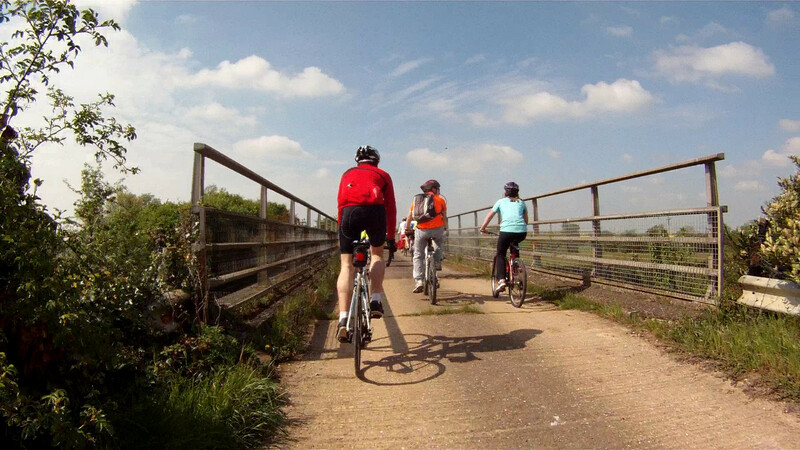 The A10 Corridor Cycling Campaign is working to improve cycling facilities on this route and organised an enjoyable campaign ride on 19 May 2013 to highlight some of the issues. By special permission we were able to use the accommodation bridge that will become the cycle crossing of the M11. The bridge is vital as it allows cyclists to avoid the roundabout junction of the M11 and A10 south. The bridge was built to provide access to farmland when the M11 divided the land. It is someway off the line of the A10 and it needs to appear to be a short and convenient link so people are not tempted to take a shortcut across the roundabout. A route is needed from the end of the busway path across the bridge to the corner of the A10 at the crossing of river Granta. This would be about the same length as crossing the roundabout. We took a route that felt like a diversion. Map showing the accommodation bridge with our temporary route in blue and desire routes in orange and pink. The route alongside the A10 as far as Frog End, north of Melbourn, has a tarmac surface and is shared use though pedestrians are rare. Like so many of these paths there appears to be no maintenance and if you travel along the path you have to dodge overhanging trees and skirt round cracks in the surface. It’s also narrow, requiring constant attention and I could hardly imagine trying to cycle it at night being blinded by the lights of oncoming cars. The route was OK for a leisurely cycle at low speed but at typical commuting speeds of 12–16mph[1, 2] this isn’t suitable or attractive, so you have the choice of playing with motor vehicles on a very busy road or not cycling. I’m not sure this could become a big leisure route simply because riding next to rushing traffic for a long time isn’t what I go out to cycle for, though I might do it for a stretch to get somewhere. There are relatively few junctions on the route but crossing a side road to a trunk road can be a dangerous and intimidating experience. A typical scene along the A10 shared-use path: a narrow strip of tarmac with encroaching trees, overgrown edges, a cracked surface and… a wide verge. 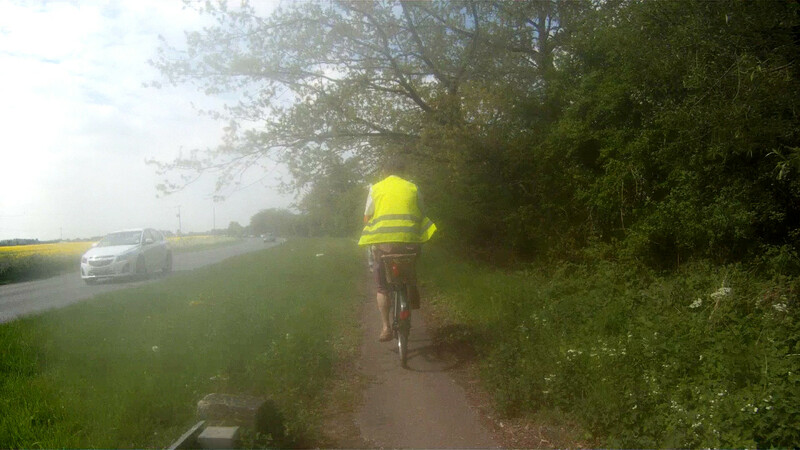 As part of its large Cycle City Ambition Grants (Wave 3) application Cambridgeshire County Council is proposing “to widen the existing path to a 2 metre wide shared use facility, with a 1 metre verge strip to keep users away from the carriageway” on the Harston–Foxton–Shepreth route. While I welcome this investment it should be more ambitious still. The aim should be for a 4 metre wide cycle track that, outside the villages, is shared use in the Dutch sense, i.e. as there are very few pedestrians those on foot can share the cycle track. The key thing is that it is built as cycle track that is direct, smooth, convenient route so cyclists can travel at 20mph+. In the villages the aim should be for full segregated of pedestrians and cyclists. Why a width of 4 metres? Firstly that’s what the Dutch have found works for cycle tracks and I suspect that this A10 route will become very busy if built as a high quality route – the experience of the busway path, amongst others, backs this up. Secondly a wide path means machinery can get on the path to build a smooth, flat surface and for sweeping, gritting and other maintenance. We need to consider maintenance when these tracks are built otherwise maintenance will be too expensive and may be neglected. The picture above shows that in parts of the route there is space for a wide cycle track. Clearly achieving this through the villages is going to be difficult and in the rural areas there may be resistance to replacing the verges with cycle tracks. I hope the A10 Corridor Cycling Campaign will follow Ely Cycling Campaign’s ‘Go Dutch’ approach and that Cambridgeshire County Council will change their strategy to aim for a world-class route along the A10. This entry was posted in Cycle routes, Cycling and tagged A10, Cambridge by rich257. Bookmark the permalink.